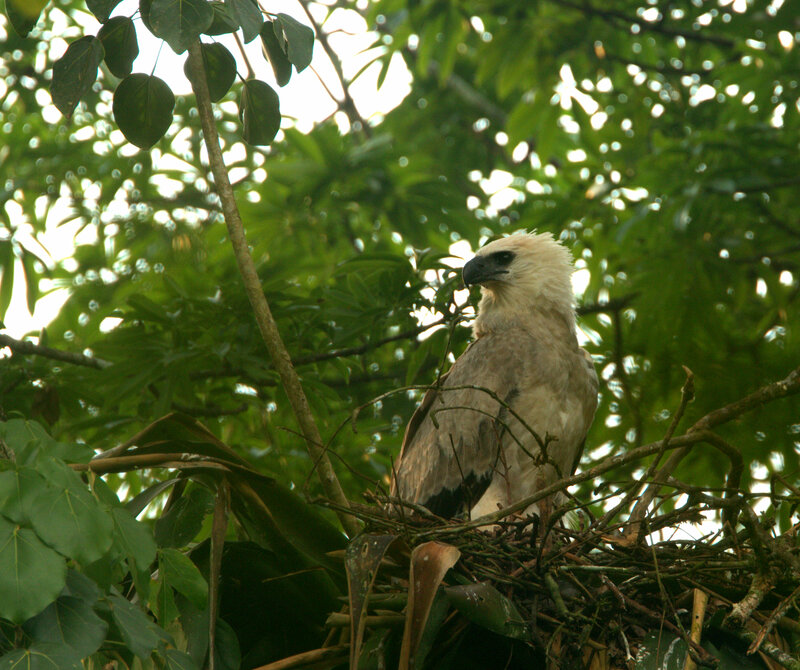 Between 2006 and 2014, BFREE and the University of North Carolina at Wilmington established and implemented an intensive Harpy Eagle and avian monitoring program onsite in the BFREE private reserve and in the Bladen Nature Reserve. 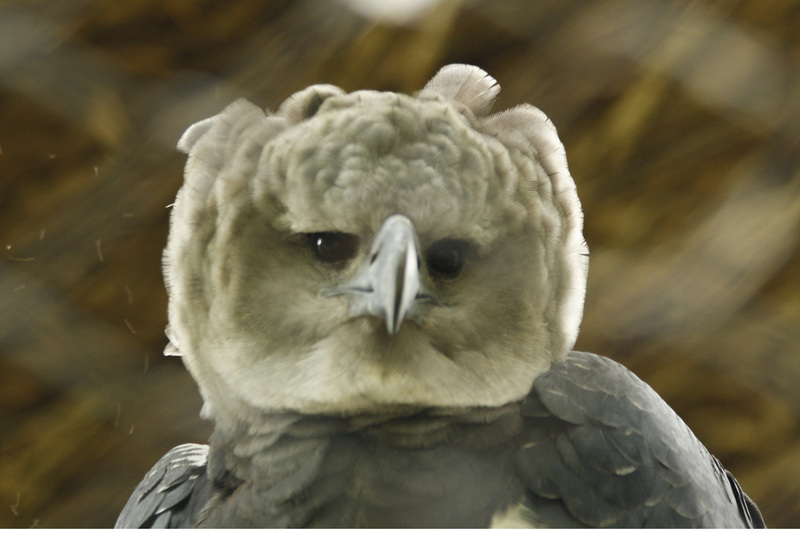 Juvenile Harpy Eagle spotted on the nest during a routine monitoring expedition in 2013. Photo by Kai Reed. Utilizing MoSI (Monitoreo de Sobrevivencia Invernal – description below) methods, the goal of the project was to build capacity for avian conservation in the Maya Mountains Massif (MMM). 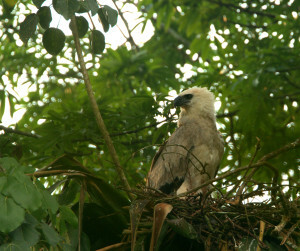 The project objectives include: 1) To monitor, study, and protect the most-northerly known wild, breeding population of Harpy Eagles in the Americas; 2) Investigate the Bladen Nature Reserve for eagles and nests based on data accumulated each of the prior years of monitoring and research; 3) To enhance and upgrade our survey and monitoring of Neotropical migratory and resident birds in the Bladen Nature Reserve (BNR) and BFREE lands, and to provide base-line data contributing to regional-scale bird conservation and sound management; 4) To develop community-based alternative livelihoods and environmental awareness of protected areas; 5) To develop community based environmental awareness of the MMM through a science based environmental education program. In 2015, BFREE released, “Wings of Hope,” a film chronicling the re-discovery of a population of wild Harpy Eagles in the Maya Mountains of southern Belize. It details the history of the BFREE and UNC Wilmington initiative born from this discovery – the Integrated Community-based Harpy Eagle and Avian Conservation Program. Created by Emmy-award winning filmmakers, Richard and Carol Foster of Wildlife Film Productions, this 20-minute documentary is rich with breath-taking footage of adult and juvenile Harpy Eagles and other wildlife and vistas found in the pristine tropical forests of the Bladen Nature Reserve. In 2012, BFREE was presented with a Partners in Flight award for efforts in bird conservation. This award was a result of various components of the avian monitoring program, which included training locals from buffer-zone communities to become para-biologists and conservation advocates. The Harpy Eagle: Leading to Community, was written by Elizabeth King Humphrey and featured in the 2012 issues of UNC Wilmington’s annual magazine for the College of Arts & Sciences. MoSI (Monitoreo de Sobrevivencia Invernal): Assessing Habitat-Specific Overwintering Survival of Neotropical Migratory Landbirds – see description of MoSI here. 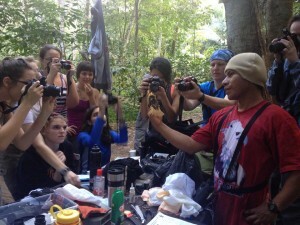 BFREE Avian Technician provides a bird banding demonstration for university students using methods learned during years of intensive training.